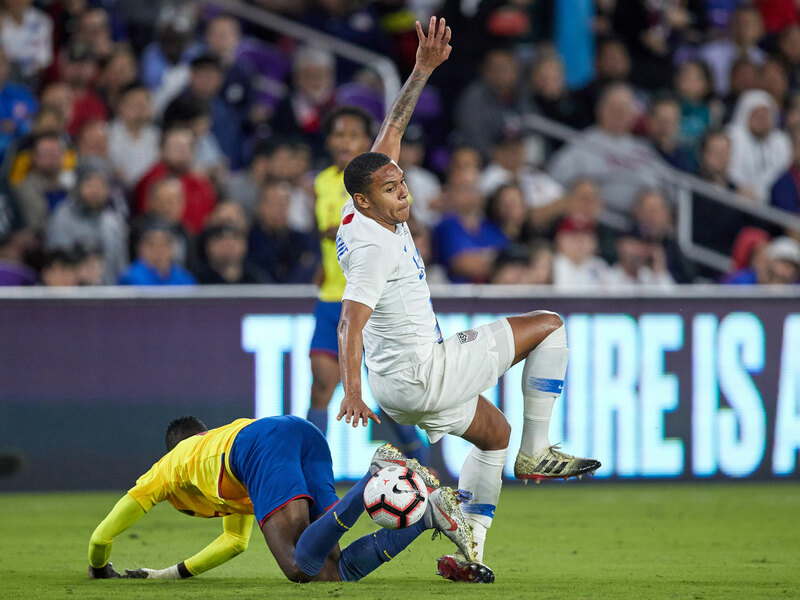 Tyler Adams won't feature vs. Chile, and more changes are expected on the field as Gregg Berhalter continues to evaluate his player pool before the Gold Cup this summer. The most scrutinized aspect of the USMNT's March camp will wind up being a one-time deal–at least this time around. Tyler Adams has departed camp and returned to his club, RB Leipzig, ahead of Tuesday's friendly vs. Chile and after his debut as a right back in Gregg Berhalter's tactical system Thursday night in a 1-0 win over Ecuador. No replacement will be called in, according to U.S. Soccer. Adams fared well in his first match in a new spot, going 91/97 passing (94%), getting involved in the attack and having an early chance deep in the Ecuador area. Balancing his moments to go forward vs. staying home–a staple of the right back in Berhalter's approach–remains a work in progress, and the U.S. was nearly caught out a couple of times when Ecuador played into the space vacated by Adams. It was covered well by right center back Aaron Long, though, and the Americans wound up limiting Ecuador to just one shot all night. Prior to the Ecuador match, Adams spoke of the challenge in taking on the new position, which calls on the 20-year-old to take on a lot of responsibility. "It’s definitely an interesting role," Adams told U.S. Soccer's website. "Nick Lima did a good job with it in January Camp and I’ve had the conversations with Gregg that have helped me understand what he wants from it. "The analogy you can make with it as how Manchester City plays. They have a left back that moves into central midfield in attack. Obviously, it’s on the opposite side here, but you often find yourself tucked into the middle of the field being able to help with the transition plays and attacking in different roles. The most important thing that Gregg emphasized was that the No. 8 can take up that position, the winger can take up that position and I can take up that position at different times. The chemistry and rotation between those players will be very important." Figuring out that chemistry will take more time, but Adams won't have any more of it until before pre-Gold Cup camp in late May and early June. Another player who is out of the mix on Tuesday night is Weston McKennie. The 20-year-old Schalke midfielder suffered a nasty-looking ankle injury but will remain with the national team for more evaluation as opposed to going back to his club. Berhalter said that nothing is broken, which is good news after McKennie required assistance to hobble off the field before getting stretchered to the locker room. On Saturday, McKennie was wearing a boot and walking with crutches during the team's training session. He is set to see a specialist here in the U.S. The only other roster move involves goalkeeper Jesse Gonzalez, who will leave the team temporarily to rejoin FC Dallas for its weekend match vs. Colorado before rejoining his international teammates in Houston. If anything, it indicates that Gonzalez isn't really in frame to start Tuesday. Ethan Horvath always figured to be ahead in the pecking order for one start after Sean Johnson earned the honors Thursday night. With Adams and McKennie out of the mix, it gives Berhalter some choices to make. He's spoken openly about wanting to get the chance to evaluate as many players as possible in the short window before the Gold Cup, which would indicate multiple changes are on the way. Lima wasn't in uniform Thursday night, but he could find himself starting at right back again given that Berhalter has elected to play DeAndre Yedlin as more of an attacking winger than a right back and there's no other nominal right back with the current squad. McKennie's place in the midfield could go to Cristian Roldan, who fared well in January camp and came on in his place Thursday night. Sebastian Lletget is another candidate to see more time in central midfield, should Berhalter ring in the changes. Other players with the squad who didn't see the field Thursday were center backs Matt Miazga and Omar Gonzalez; left back Daniel Lovitz and forwards Corey Baird, Christian Ramirez. Roldan, Yedlin, Lletget, Michael Bradley and Jonathan Lewis were given minutes off the bench in the win, which was the third straight–and third via shutout–to start Berhalter's time as manager.